The iPhone, as the above article in New York magazine states, has a reading application. It might be feasible to actually read an entire piece on your phone and absorb it. But I would imagine that even the briefest articles would seem unduly long if a “page” on your iPhone -- that is, the text available on your screen -- accommodates no more than a paragraph. The web is for little bite-sized bits of information. It is not a place to read anything longer than a headline. But it seems pointless to fight it. In the near future, the whole world will be channeled right to your phone. If you can Tweet an entire movie review on Twitter, then what is the point of trying to craft an essay that tries to lay out a sophisticated argument for or against a film? All we can do here, I suppose, is to keep swimming against the tide. The Kindle, which has a nice name, is designed to approximate the experience of reading an actual book, but without having to soil your hands by having to hold the real thing. Maybe the name Kindle came out of the idea that if you buy a Kindle you can use your real books as kindling to start a fire in your fireplace. The Kindle will give you access to hundreds of books, newspapers, periodicals, and whatnot, which simply means that you can quickly move on to something else if you happened to get bored. 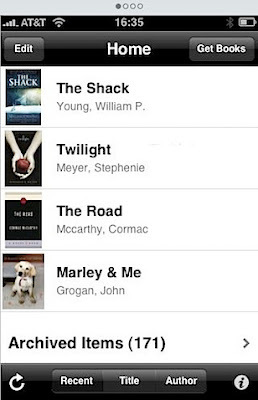 "Stanza, like Kindle, lets users download new content directly to their device. It has a snappy interface that allows readers to flip through a book simply by tapping the edges of the page and responds far faster than Kindle's poky E-ink screen, which takes about a second to turn pages." - Forbes.com, Oct. 2, 2008. Now, you read that right. The Forbes writer declared that you are wasting valuable time in your life with a Kindle because it takes "about a second to turn pages." The writer described that pace as "poky." I admit that a book or an article should grab you right away -- that is what in the newspaper business we used to call the compelling lede -- but these digital reading applications obviate the need for any kind of commitment to the story, which a book requires. You can read a snippet of just about anything and move on. But commitment to the content seems beside the point. What you are being asked to do is commit only the device that distributes your information. 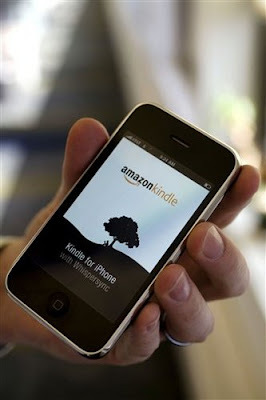 From the New York Times of March 4, 2009: "Amazon said that it sees its Kindle reader and devices like the iPhone as complementary, and that people will use their mobile phones to read books only for short periods, such as while waiting in grocery store lines. “'We think the iPhone can be a great companion device for customers who are caught without their Kindle,' said Ian Freed, Amazon’s vice president in charge of the Kindle." Let us now hope that the phrase "a great companion device for customers who are caught without their Kindle" enters into the popular lexicon, much like "wardrobe malfunction." "But, darling, I was caught without my Kindle! ", you can explain. By now you can see where this is heading. Reading is to fill those brief, empty spaces that you experience when you are waiting to buy something. What you read is a disposable item -- in fact, if you grow up thinking that everything you read only comes through some kind of screen -- writing isn't even something that an actual person produced. It just floats out there magically in cyberspace waiting for someone to log on to it. Book lovers will tell you that they hate to sell them, hate to give them away, hate to have the dust jackets ruined. But they love to have them just hang around the house. Book lovers will just take a book down off a shelf and spend some time with it, and even read no more than a few paragraphs to reconnect with the thing. A book isn’t thought of as a product, and it certainly isn’t just a vehicle to distribute information. It’s much more valuable than that. It’s an heirloom and a distant memory and a constant companion. A book, then, was a thing very close to the author. A book, a novel, a hardcover, the paperback, got you very near the source. You got the feeling -- even if it wasn’t true -- that the published novel was as close of an approximation of the author’s physical vision of his writing that we ever would see aside from the writer designing and publishing the book himself. Maybe in some cases it was even closer to the author’s vision -- sometimes a writer is not a very good judge as to how their work should be presented. But that is why we love books -- it is a complete experience. The entire packaging brings us closer to the contents. We have a fondness for almost everything associated with favored books -- down to the tactile experience of how the paper feels on the fingertips. 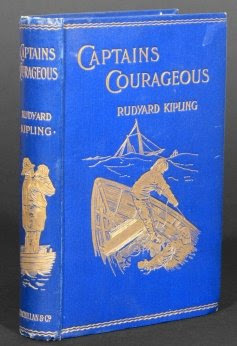 And because of this connection, because of this very real connection from one book to the next, we feel we owe the author of the next book we buy, or borrow, or find, the respect of giving his work a chance. We will offer up the commitment because we know, if the author speaks to us, everything else about that little volume will end up giving us some kind of pleasure, too. It is inevitable because the published book allows is to feel the craftsmanship, the care, the nurture, indeed, the love that has gone into its production. We can see the human fingerprint on a published novel, because it feels to us to be only one generation away from the original manuscript itself. That is what I have been meaning to say. We are getting away from the source. We don’t know where our water, or our food, or where are art comes from any more. All were once locally produced, and now they come from some far off places -- in some cases they originate from a place you cannot find on a map. The iPhone, and the Kindle, brings us further away from the original manuscript and the published novel of that manuscript. These things could not be less human or less impersonal, and they offer up no chance for love. It is essential to feel connected to art, and to nature, but now we seem to have entered into an era where we experience only the facsimile of just about anything. This has been a long time coming. In the anthology of essays titled “Man and the Movies”, editor W. R. Robinson wrote in his introduction: “Since the Renaissance... Western man has been fascinated by the reality and delights of vision. That fascination has grown until today we buy the package ... rather than the substantive product; we vote in presidential campaigns for the image rather than the ideology...” This was published in 1967. If today we see Picasso’s “Guernica” reprinted in a magazine we simply believe that we have “seen” it, that we have experienced it. That path has led us to think that staying at a pyramid-shaped hotel in Las Vegas is akin to having visited Egypt. There is no question that our burgeoning Republic was lucky enough to have Thomas Jefferson as its primary writer. His prose is consistently lovely and clear (even if his finances were not), and it is no wonder that, when Jefferson’s prose was transcribed onto that official document, the calligrapher was made to insert the word “only” into that sentence. It would have been forceful nonetheless: “Our repeated Petitions have been answered by repeated injury.” But as the document was being written out, or proofed, someone noticed that the extra two beats of the word “only” was missing, and that it was essential to be inserted. Maybe it was Jefferson himself who noticed the omission. So in the document you can read that sentence, "Our repeated Petitions have been answered only by repeated injury." And floating slightly above the sentence is the word "only", with the proofreaders mark, the upward turned arrow, showing where the word should be inserted. 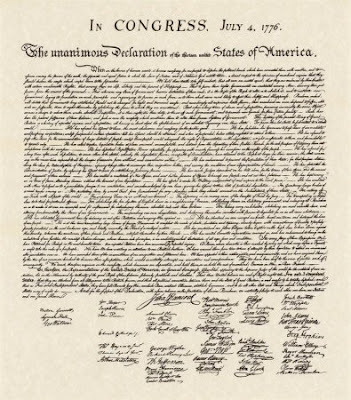 Because of that tiny mistake, it is easy for me to realize the “Declaration of Independence” was created by people. It is a human creation. I can never overestimate how much more profound my connection to this document is because of that slight amendment. It is an imperfection that makes the thing even more perfect still. The error allows us to see the human being within the art. Today, there are no mistakes, no early drafts of poems or revisions of novels. If the robots of today can begin to express human emotion, then what will prevent young people in the year 2025 believe that the Bible is nothing more than html. I want to say, don’t be afraid of scratches on the record, or double imprints on the coin, or inky revisions on emerging versions of the manuscript, or frayed, cloth-bound first editions. But soon, very soon, everything and anything, from the classified ad to “Angela’s Ashes” to “Burt Dow, Deep Water Man” will be available in the same font on the same glassy-eyed computer screen. We will be able to read each in little bursts in the checkout line, if we so choose. But some of us will not. I'm not a doom-and-gloomist here. I'm not going to say that this road will turn us all into a bunch of cyborgs who won't know whether our emotions are real or implanted by a computer chip. I think society will break into three camps, each thinking they are correct: one will think technology is the answer to all our communication and business needs and will create success, the second will believe that hardcopy books and periodicals lead to a quieter, more spiritual and stable kind of life, and there will be a third camp that won't care about either. These camps will mingle just fine with one another - families will have proponents of each philosophy -- and society will debate the value of each approach. The discussion will last forever -- and no matter who lopsided the debate may get, each side will passionately believe it has won.